Evaluating peace, justice and strong institutions is complex, tricky and arguably the most difficult to measure out of all the UN’s Sustainable Development Goals (SDGs). 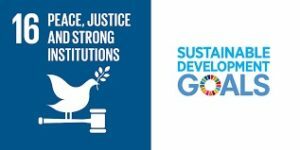 Goal 16 urges us to: “Promote peaceful and inclusive societies for sustainable development, provide access to justice for all, and build effective, accountable and inclusive institutions at all levels”. It has the highest number of targets compared to other goals that require us to go beyond traditional evaluation methods and approaches. Moreover, the indicators alone are not enough to measure and support progress on such a complex goal. The challenge is that peace, justice and strong institutions are fundamentally political and therefore fundamentally contested; different political perspectives would choose different things to monitor and measure and under those circumstances how could you reach agreement on indicators, tools and contextualised data? In some ways, institutions are analogous to the rules of game in a competitive team sport. That is, they consist of formal written rules as well as typically unwritten codes of conduct that underlie and complement formal rules (North, 1990). In many fragile states where Oxfam works, , formal institutions either don’t exist or they are not functional so in such situations oftentimes informal institutions take the lead in governance and peacekeeping. When it comes to examining Goal 16, if we neglect the role of these informal institutions we risk missing many developmental objectives. So, an uphill task for evaluators is how to incorporate informal institutions into the indicators. Contemporary discussions on culture, practice and values draws heavily from the work of Hofstede that describes the effects of a society’s culture on the values of its members, and how these values relate to behaviour. The widely accepted understanding is that symbols, heroes, and rituals are the tangible or visual aspects of the practices of a culture. See the attached photo from a discussion at the EvalPartners’ Global Evaluation Forum in May 2017 in Bishkek, Kyrgyzstan. To measure peace one needs to also collect a combination of perception-based and objective data ensuring that the “Do No Harm” principle always takes precedence over the desire for accountability and robustness of evidence. Despite the fact that people’s actual experiences and perceptions are hard to generalise, such an effort if undertaken, could generate interesting thematic analysis and regional statistics about their fears, priorities and definitions of peace in their respective contexts. See Everyday Peace Indicators Initiative. As realised by the SDG indicator 16.1.4, to measure overall progress towards lasting peace, we could include within our M&E frameworks the measurement on people’s perceived level of safety while walking alone around the area they live in, within their respective contexts and how the planned intervention influenced this perception. The programmes and evaluations in situations of conflict could also benefit from incorporating people’s psychosocial wellbeing in their strategic planning and data collection especially if the goal is to promote an environment for human development and human security (the “positive peace”) compared to eliminate deaths (the “negative peace”). The final evaluation of Oxfam’s programme ‘Opening the space for enhanced food security and livelihood recovery in Gaza Strip’, 2016, suggests that providing psychosocial support to people living in conflict results in improved livelihoods, especially for vulnerable women. RAND’s study, “The invisible wounds of war” suggests that in developed countries the economic cost of untreated trauma is actually higher than the cost of providing treatment, due to lost work, loss of economic productivity, substance abuse, domestic violence, homelessness and other issues. This might imply that investing in improving the wellbeing of people and accounting for omitted cost components—such as substance abuse, domestic violence, and homelessness living in conflict would mean the savings to society would likely be even greater. A huge challenge for evaluating SDG-16 is that it asks for highly sensitive information to be shared. Firstly, the information itself is hard to acquire as the information infrastructure in most fragile and conflict-affected states are almost non-functional, and secondly, there is a risk that authorities may underreport to prevent naming and shaming – as human beings we are all biased! The private sector, think tanks, CSOs, Academia, UN agencies and National Statistical Offices are all collecting data on the SDG-16 but we have yet not been successful on establishing a platform for sharing this data. Measuring peace, justice and strong institutions is difficult, fundamentally political and contested amongst multiple political perspectives and this makes it hard to reach agreement on indicators which then makes the measurement difficult. Some nuggets from the active debates in measuring peace however are adopting flexible approaches, assessing both objective and perception-based indicators and above everything mobilising the state, civil society and private sector to share and use data for learning and adaptive programming. See report from an interesting conference on this organised by the International Peace Institute, One Earth Future Foundation and the SDG-16 Data Initiative. My eyes are set on some robust discussions and solutions on measuring peace at the Joint Conference “Evaluating the SDGs” that is bringing the state actors, civil society and the private sector together in Mexico from December 4-8, 2017. The conference is organised by the International Development Evaluation Association [IDEAS], Latin American Evaluation Associations, ReLAC, REDLACME and the state and university of Guanajuato, Mexico. Hur Hassnain is Global Advisor at an International NGO based in the UK, Board Member at the International Development Evaluation Association [IDEAS] for Asia Pacific Region and the founder of Pakistan Evaluation Association [PEA]. Hi Hur, thanks for another great article. I like your suggestion of “going beyond traditional evaluation methods and approaches to measure the SDG-16”. This requires a microscopic lens that zooms in on a specific pathway within the formal and informal institutions. Latter is complex, as they come from socially transmitted information and are a part of the heritage that we call culture. Here the governing structure is overwhelmingly defined by code of conduct, norms of behavior and conventions. Underlying these informal constrains are formal rules. When there are no formal rules, how the order was preserved in stateless societies?. Today world is facing complex, interconnected and resilient conflicts. Evaluation community must evaluate the role of informal institutions in resolving disputes, applying sanctions, preserving the peace and forestalling violence. On the flip side of it the informal institutions are most fragile too, many believe that they were the ones, who provided the legitimacy initially in to the Taliban-led forces in Swat conflict back in 2009-10. Hur thank you again for interesting thoughts. I believe everyone within the Development Community need to read through and do the assimilation for the betterment of their understanding of these central and critical concepts. Keep writing and sharing!